Browse through the best practice information below to see SpatialStream™ in action and learn more about the cutting edge trends of spatial technology and best practices for spatially enabling your application. Best practice information includes: best practice videos, technology trends videos, and articles about emerging trends in spatial technology and development tips. View "Mapping Secrets Unveiled: Top Faux Pas & How to Avoid Them" to learn all of the information you need to succeed with mapping, improve your user experience, and make your site stand out using location technologies. Cloud computing has come on the scene in a big way and can help alleviate organizations' GIS, budget and technology adoption difficulties. 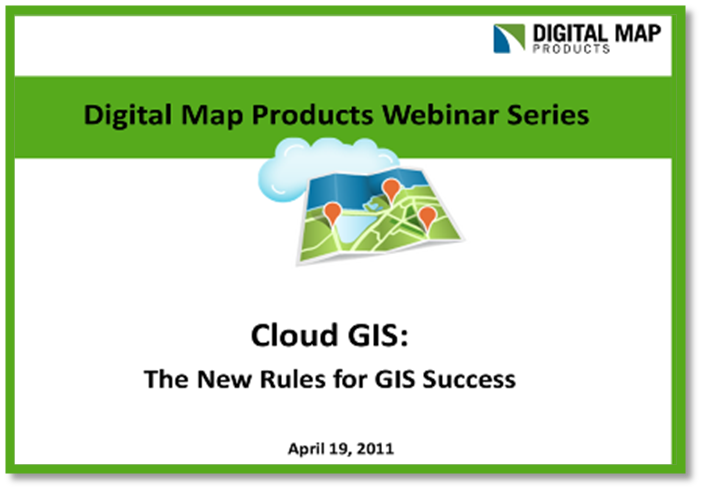 By watching this webinar you'll learn best practices and tips for how your organization can succeed with Cloud GIS. What's Next for Real Estate & Mapping explains which web 2.0 and location technology trends matter to online real estate in 2011. By watching this webinar you will gain an in depth view of which trends have staying power and which will have the biggest impact on your site. This educational webinar discusses why the hyper-local phenomenon sweeping location based technologies is more than just hype, the value of presenting your content and services at the hyper-local neighborhood level, and how to make the business case for adding new hyper-local search and mapping display options to your site. In the following three videos Digital Map Products' Director of Marketing Annie Schwab and Product Manager Skip Cody discuss why the cloud and GIS are the perfect match, how GIS is changing as a result of its migration to the cloud and how to leverage the cloud for GIS sucess. 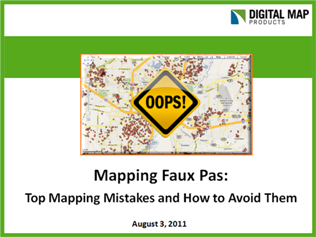 This video shares common mapping faux pas that occur in real estate mapping development and tips on how to avoid these mistakes. This video is from a presentation given at Inman Connect 2011 in San Francisco by Digital Map Products' Director of Marketing Annie Schwab and Product Manager Skip Cody. This video highlights Russ Bergeron, CEO Midwest Real Estate Data, Marty Frame, President of RPR LLC, and John Hensley, Chief Product & Technology Officer for LPS Real Estate Group, as they provide great insights and an exciting debate about online real estate trends and mapping and location technology trends at Inman Connect NYC. This video features Digital Map Products' Jim Skurzynski, Geoffrey Wade, and Annie Schwab discussing the future of spatial technology, how it is going mainstream, and new methods of developing spatial applications. This video features Digital Map Products' spatial technology experts, Jim Skurzynski, Geoffrey Wade, and Annie Schwab discussing how the real estate industry has been an early adopter of location technologies and the ways they're benefitting from increasingly sophisticated mapping technology. This podcast features Digital Map Products' Jim Skurzynski and Skip Cody at Where 2.0 discussing the evolution of SpatialStream and how it is making spatial technology more widely accessible to a broader audience. This whitepaper offers several tips on how to successfully spatially enable your application without it being a mission impossible. It also highlights common mapping pitfalls so you can strategically avoid them. This whitepaper discusses the many benefits of Parcel Boundary Data and why it's one of the most in-demand additions to real estate websites. Digital Map Products CEO Jim Skurzynski talks about how parcel boundaries improve real estate decisions and explains the complexities of this data set. This whitepaper addresses a new trend in real estate websites: parcel boundary data and how it relates to distressed properties. Digital Map Products CEO Jim Skurzynski walks readers through the many benefits of parcel boundary data and why you need to use an online foreclosure site that has this critical data. In this blog post, Digital Map Products' CEO Jim Skurzynski explains why it's more important than ever to understand how people are using GIS, what their expectations are and how these new end-users are different from traditional users. Digital Map Products' CEO Jim Skurzynski shares five reasons why real estate companies should embrace website mapping and location data tools even in a tough economy. Digital Map Products' CEO, Jim Skurzynski, provides an insightful look at some of the reasons why the cloud is supercharging spatial technology adoption in a guest post on the Very Spatial Blog. Tech Savvy Agent Describes SpatialStream as "The Future of Real Estate Mapping"
Tech Savvy Agent, a respected and cutting-edge real estate blog focusing on innovations in social media and technology, recently highlighted the capabilities and features of SpatialStream and the promise it holds for real estate mapping. In a recent blog entry Duke Long, a popular commercial real estate broker and blogger, featured SpatailStream. The blog entry discusses the SpatialStream platform, capabilities and features. This article provides an overview of the key trends Digital Map Products' CEO Jim Skurzynski heard at the conference. In the article he discusses the future of real estate technology, the evolving role of real estate agents, new technologies like Foursquare and how spatial technology is being used to enhance the understanding and value of real estate information. Jim Skurzynski explains how, despite the recession, 2011 will be the year of the cloud for GIS. Additionally, he goes over what trends and changes have been a catalyst for the movement and how the cloud helps solve many of the traditional problems associated with GIS. Vector1 Media editor, Matt Ball, interviews Jim Skurzynski about the growth of Digital Map Products, the increased demand for easy-to-use spatial technology, and how turnkey solutions like SpatialStream are making geospatial technology more accessible to companies and organizations of all sizes. Inman News "MRED & MRIS Get New Mapping Platform"
Inman News, the leading source for real estate and technology news, discusses the recent partnerships between Digital Map Products and two of the leading multiple listing services, MRED and MRIS. Through the partnerships, MRED and MRIS will utilize the SpatialStream platform to provide interactive trend maps, heat maps and advanced data visualization tools to MLS members. Slashgeo, a community-driven website for news and discussions about GIS, location-based services, remote sensing, GPS and everything geospatial, recently shared our article about the ParcelStream web service and the benefits of parcel boundary data on their blog. Inman News "Mapping Firm Gets Neighborhood Data"
Inman News, the leading source for real estate and technology news, elaborates on the recent partnership between Digital Map Products and Maponics. Website Magazine Blog "Mapping Services: Extending the Boundaries"
This blog entry discusses the partnership between Digital Map Products and Maponics, which brings together sophisticated online mapping technology with in-demand location data sets. Through their partnership, the two companies are making it easier than ever to enhance web applications with mapping technology and GIS data. This recent Bing Maps blog entry highlights how the ParcelStream API can let you can add parcel boundaries to your site in less than 10 minutes. Inman News "Geospatial Mapping Platform Launches"
Inman News, a leading real estate publication, discusses the benefits and advanced capabilities of the SpatialStream platform. Property AdGuru "New Mapping Product Launched"
Property AdGuru, an online publication for real estate agents and property developers, announces the launch of SpatialStream.